Hi there and thanks ever so for popping in! Hope you've had a lovely weekend....and haven't gone too crazy with the choccie eggs! For those of your that don't know in "real life" I work in a DIY store and this time of year is by far the busiest for us, so many people plan projects to do over the long weekend......so if any of you have had to spend your weekend with a paintbrush in your hand....you have my sympathy, lol! This adorable stamp is "a lick of paint" from LOTV, isn't it a sweetie! I have coloured this with promarkers, the gingham paper is a freebie download from Bev Rochester's blog, the button and twine are from stash. The colour strips "followed" me home from work, as I thought they'd make a smashing addition to this card. 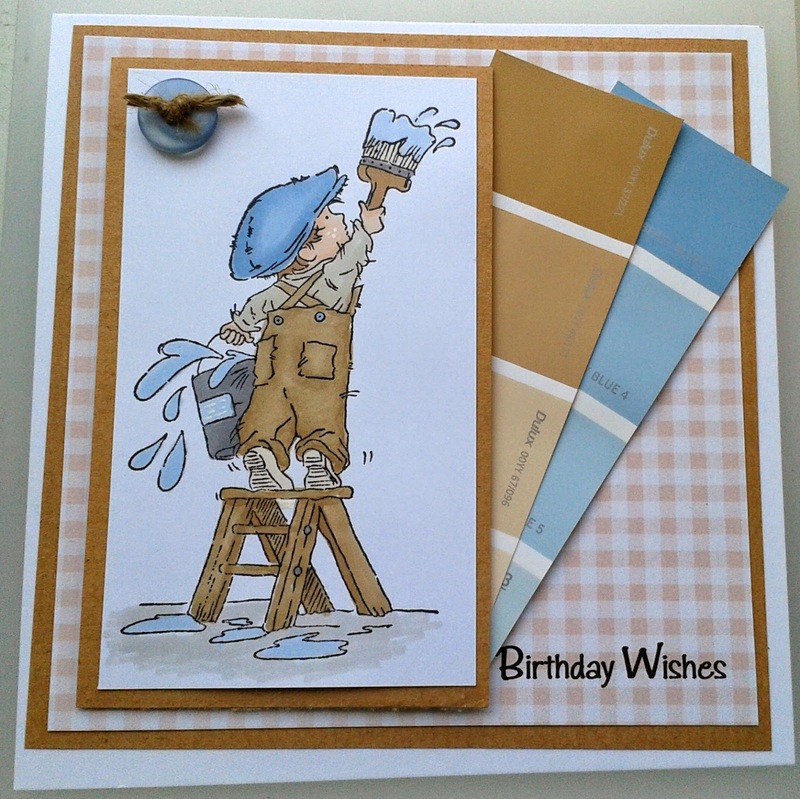 Hi Lisa, gorgeous card and a clever touch with the paint samples! This is wonderful Lisa, I love the image and such a great idea to add the colour charts in the just the right shades! Perfect card AND use of the paint strips, will have to try and remember this LOL. A fab card Lisa. I love the paint samples - very clever idea. This is a brilliant card Lisa, I love your image and the colour strips are the perfect embellishment - great idea. Such a sweet card Lisa, fabulous idea to use the matching colour swatches.